In my last article, I have introduced you with Excel events and their types. In this article, I am going to narrate you how to enter Event Handler VBA code in the relevant code module. Every event-handler procedure, I mean VBA code, must be placed in the relevant code module. If you are working with workbook related events, then the VBA code that you write for your event will be placed in the “ThisWorkbook” code module. The code, you write for worksheet related events, will be stored in the relevant worksheet code module. For example, say you want to show some message when “Sheet1” is activated. 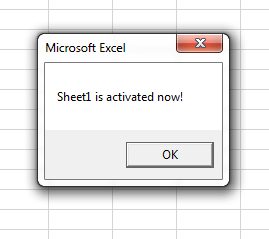 Excel has an event for this: “Activate” event. So, your VBA code, written for this event, will be stored in the “Sheet1(Sheet1)” code module. Look at the following code and image to see how the code is placed in the “Sheet1(Sheet1)” code module. Activate Event Handler is created in its relevant code module. MsgBox "Sheet1 is activated now!" Every event-handler(the procedure or VBA code that controls the event) has a predefined name. For example, the figure below shows the code module for the “Sheet1” worksheet. I got this code module just double clicking on the “Sheet1(Sheet1)” in the Project window. Then I selected Worksheet from the left drop-down list, and finally chose and clicked on the “Activate” event. I got a Subprocedure with two statements: first statement is just name of the Subprocedure, and second statement is “End Sub” statement like the following figure. There is no other code inside these two statements.The Subprocedure name is predefined by Excel. I wrote my event-handler VBA code between these two lines. Event has predefined Subprocedure name. Event-handler procedures may also contain arguments. In my previous example, I have shown how to display a message when a specific worksheet is activated. In this example, I’ll explain how to work with an event that will display a message when you activate any of the worksheets. SheetActivate Event’s starting statement and end statement is created. This procedure has one argument (Sh). Sh represents the activated sheet; it means that if you activate “Sheet2”, the value of Sh will be Sheet2; if you activate Sheet5, the value of Sh will be Sheet5 and so on. “Sh” is declared as an Object. The following code makes use of information passed through the argument “Sh”. The code find out the name of the worksheet by accessing the argument’s(Sh object’s) “Name” property. MsgBox Sh.Name &amp; " was activated." 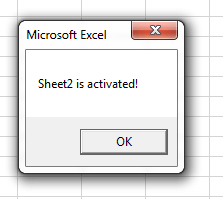 I have activated “Sheet2” and this message displays. Msg = "Have you checked your printer connection?" BeforePrint event is executed just before printing something. I am explaining another important job, you can do with “BeforePrint” workbook event. Say you want to print the content of Excel cell “A1” in the page headers or footers. The following example shows a code that make possible to print the content of cell A1 in the page header.